Just like other big IT names like VMware with their vExpert, Microsoft with their MVP and since last year EMC with their Elect, now Cisco started their own community appreciation program called Cisco Champions. I want to focus on Data center Champions in particular since that’s the business I’m in myself. I’m not (much) into Cisco Data center networking technologies myself (yet), other than SAN related Fibre Channel equipment, but I’d like to dedicate this post to the start of this new community appreciation program nevertheless. The “community” is all that matters these days, right? Sharing knowledge to enhance the community “brain” as a whole. Being part of the 10 original founders of the EMC Elect I know how important proper communication can be for new programs like this and since Amy Lewis was kind enough to invite Allen Ward, Sergey Kamenetskiy and myself to shine in one of the “Engineers Unplugged” series in May 2013 in Las Vegas during EMC World, I thought, let’s return the favor and promote the Cisco Champions a bit, hoping for more collaboration and improvement of the awareness that even though social networking is some way of “virtual presence to people you might not even know”, if your network is large enough it can also be seen as your online think-tank. Cisco made a list of requirements a true Cisco Champion will be recognized by. On Twitter Cisco recently published the list of the current verified Champions: https://twitter.com/ciscoDC/lists/cisco-champions. 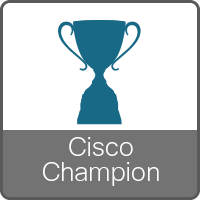 On November 15 2013 all the chosen nominees got a form asking them if they want to be called a Cisco Champion for 2014 and all the forms that were returned lead to the full public list. 2014 Will be the year that will set the baseline to start from in the years to follow. Experience gathered in the first year will improve all next years. Just like other community appreciation programs the rules to “live” by need to be defined and both Cisco and the first batch of Champions will learn and contribute to its success. Welcome to the community, Cisco Champions!